Good morning and welcome to wwwblogs. All through September, we’re taking a peek at some stupendous science fiction authors. I have the fabulous luck to know each of these dedicated, hardworking individuals. Jim Cronin appears today with his tale, The Travelers. Time travel is not for the timid. Time travel is not for the faint of heart. Join our two intrepid travelers as they embark on a journey into the past, to the days of the dinosaurs. Marvel at the sights, sounds and incredible creatures of the Cretaceous Period, and learn a bit of actual science along the way. But be wary. You never know how your actions might affect the future for us all. 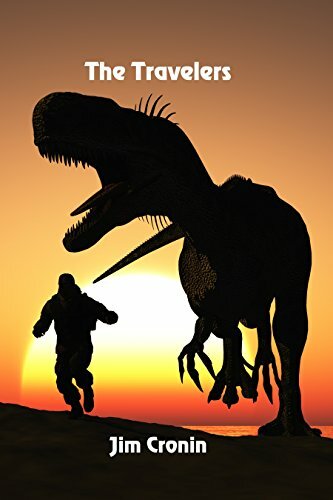 In this, my second short story of a series, I hope to create a set of tales which are not only entertaining, but are a window into learning some real science. My goal is to help alleviate the drudgery of so many textbooks through the art of story-telling and have fun, while learning at the same time. I am a retired middle school science teacher, working part-time as an educator-performer at the Denver Museum of Nature and Science. I wrote The Brin Archives as a challenge to learn something new. I have been married for forty years to the love of my life. We raised two incredible sons, and now have three amazing grandchildren to spoil rotten. I was born in Kansas City, Missouri and lived in Arlington, Virginia before moving to Denver where I attended High School and eventually college at Colorado State University, graduating with a degree in Zoology and a teacher certification. My wife and I currently live near Denver in the small town of Parker. My science fiction series, The Brin Archives is an epic adventure encompassing an entire galaxy on the verge of destruction. This trilogy, to my amazement and delight, has won critical acclaim and numerous awards. Who would have ever guessed this old, retired science teacher would become a successfully published author? I hope you enjoy my stories.